EIM Alarms Overview – Welcome to the EMIT Technical Forum! The EIM and associated modules are capable of identifying a wide range possible alarm conditions. Depending on the module there are a set of custom and fixed alarms in the system to generate an alarm event for the error condition. See the “ALARMS” section of any of the modules for details on how to configure an alarm. As discussed in the module alarm sections, most alarms can be set up to close the error relay and shutdown the engine on critical alarms (other than annunciator, which shuts down the engine directly). Active alarms will cause the “Alarms” button in footer of the display to show the number of current alarms and flash the text. Selecting this button will navigate to the Alarms screen (Pg. 40) that displays the current alarms with their associated date/time stamp, alarm code, description, and action taken. Selecting the “View” button of the associated active alarm navigates to the View Alarm screen (Pg. 41). This screen displays the alarm in additional detail and provides the option to clear the alarm by pressing the “Reset Alarm” button or examine the configuration of the alarm by selecting the “Go To Setup” button. 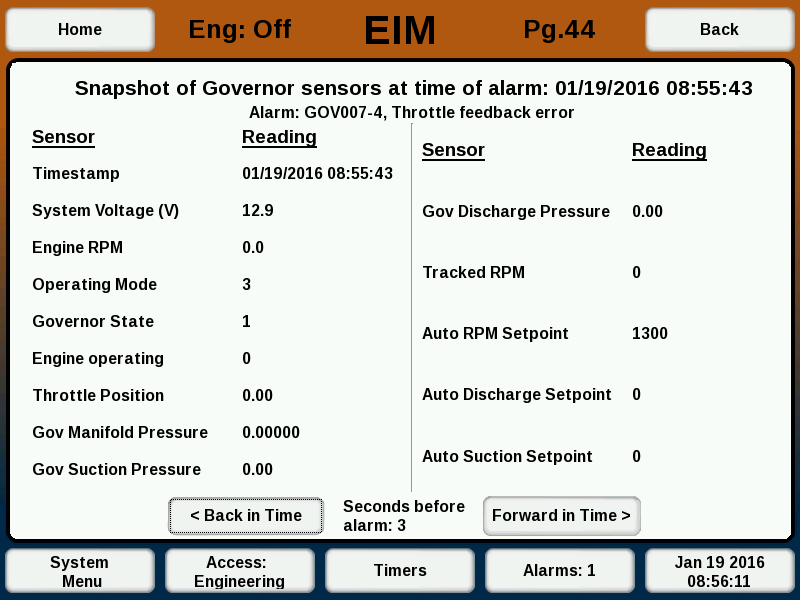 This screen also has a “Sensor Snapshot” button to see a snapshot of the sensors for the given module at the time the alarm occurred. If an alarm covers a single sensor value high or low trigger, selecting "View" will go to a graph showing the value of that sensor for the minute before the alarm. Note: Most alarms are only active if the run signal is in the “Run” condition and the alarm timer on the home page has expired. If the Run Signal Trigger is not properly configured an alarm condition could be missed. The alarms screen has a button “Alarm History” which brings up the Alarm History screen (Pg. 42) a list of all past alarms that have been acknowledged (cleared). The “< Prev” and “Next >” buttons at the bottom of the screen can be used to scroll through the list of past alarms. Clicking on “View” on an alarm will show the details for the given past alarm. For active alarms, a sensor log is saved for 60 seconds of data during the time leading up to the alarm. This log can be downloaded by inserting a USB drive and selecting 'Download'. For past alarms, a button is present to view the sensor snapshot at the time of the alarm (shown below). This list shows only the sensors at the time of the alarm (not the full 60 seconds). If an alarm pulls up the alarm graph display instead, the sensor snapshot can still be downloaded by inserting a USB drive. 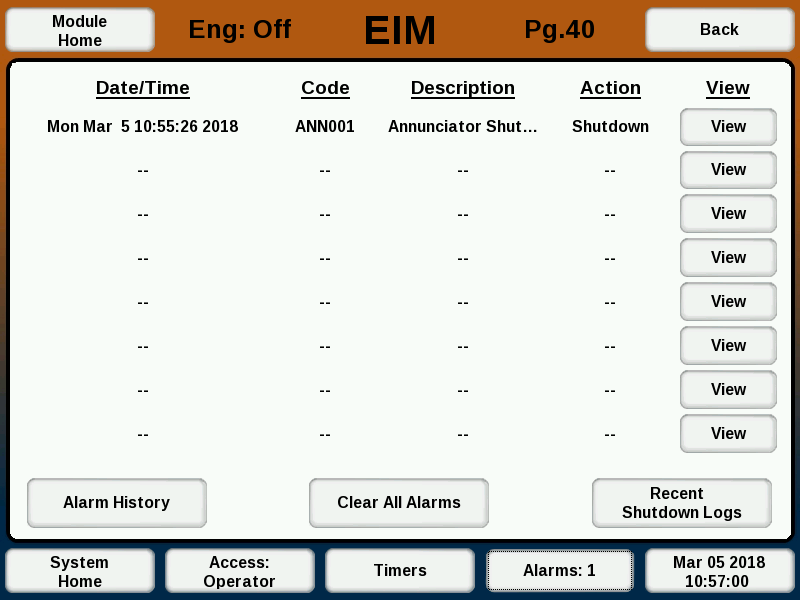 Note that the Alarm History page will show all past alarms that occurred on the EIM. The Alarm Snapshot data will only be saved on EIM versions 1.58 or newer, so some past alarms may not have sensor snapshot information. The one minute of snapshot data will only be available for active alarms. Once an alarm is reset, the history page will only show the snapshot for the moment the alarm occurred.